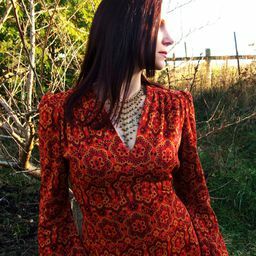 An image captured while attempting to photograph this dress for sale in my Etsy shop. We ended up telling a story through the different locations that we hit that day. This one turned into a moment of despair kind of thing and was the deciding shot for me to link all of the photos together to tell a story. I like the dramatic bluish lighting and what a stark dramatic figure the my model cuts, up on that abandoned bridge. Date Uploaded: May 23, 2015, 6:53 a.m.